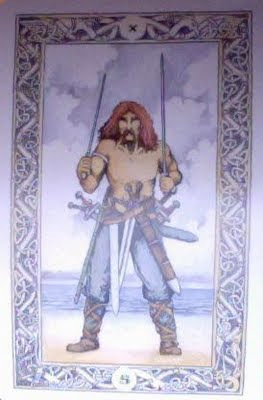 Today's Draw Classic*: Ten of Swords from the Norse Tarot. Are you riled up, ready to fight? Are you justified in your anger? Or is it even anger at all? And is it a battle worth fighting? Traditionally, the Ten of Swords is a card of utter defeat. But not in the Norse Tarot. It's just not the Viking way. Our hero is well armed to do battle. And you get the sense that, even if he's up against alarming odds, he could possibly win. But is it a battle worth fighting? Almost all of my anger is actually hurt. It happens when someone has rubbed up against one of my fears…fear of abandonment, fear of not being accepted. It's one thing to fight from a secure position. Fighting from a place of security is more often debate and doesn't require an arsenal. But fighting from a position of insecurity…well, who or what are you really fighting? And what spoils rain down on you if you win? I'd venture to say most of our battles are with ourselves. We lash out at a supermarket checker who has to look up the code for broccoli because we're annoyed at the way we've planned our day. We yell at our partner for coming home late because we feel abandoned and need more attention. In essence, we're trying to heal a broken leg by walking on it. And, often, the fight just puts more distance between us and what we're trying to achieve and receive. I've been feeling a little riled myself lately. Over the past few months, the trust I've placed in a friend and, in another situation, a business associate, has been betrayed. And telling the other person off really isn't working. In one case the person manufactured an out-and-out lie, blaming me for something she'd done herself. In the other, the dude is in complete denial about a lie they told me to get me to commit to something. In both cases there's really nothing I can do about it. It's hitting on all my own past hurts and present insecurities. Each made bad choices that I'm left paying for and, outside of revenge, which is not an option for me spiritually, there's no recourse. This makes me even more angry. But my desire to lash out and expose them publicly...haha...is coming from my own victim mentality. Nobody likes to admit to that, but it's often the truth. These situations come to us precisely to heal all that old stuff that they push up against. And they often mirror things back to us that we'd rather not see. In some ways, my issue with them is really an issue with myself. And while both know exactly how I feel, I haven't gone all Real Housewives on their asses. And won't. When I deal with these people next, it will come from a place of neutrality and/or compassion. And that's the kicker, isn't it? How often do we approach ourselves with the same love and understanding we give to others? Until we really understand what is beneath our compulsion to fight with another, we're just spinning in space, having fight after fight until we finally "get it". So ask yourself what you're really fighting. And if that means you lay down your swords and open up your tears, do it. Then show yourself some of the love and compassion you show others. The best way to defeat the negative forces in your life is to heal yourself.